It's the day after Thanksgiving and many of you will be decorating your Christmas tree this weekend. If you're anything like me, your tree is full of ornaments that hold special memories. I've mentioned before that my entire tree is exclusively cat ornaments (I'm sure no one is surprised), and my favorites are the personalized ones, the ones that honor both the precious pet I'm currently sharing my life with as well as those who live forever in my heart. Through the years I've bought a good number of personalized ornaments and made quite a few as well, so when Personalized Ornaments For You contacted us asking if we would like to design a few ornaments in the hopes we would review them on our blog, I wondered if I would be able to come up with anything completely unique. I did, and the ornaments I created are now among my favorites, and are hung over my Angel Truffles memorial table. First I chose the Snowman with Cat ornament. It's simply Mudpie and I (I'm the snow girl! ), with each of our names, and "World's Best Cat Mom" written underneath. And then there's my favorite, the Three Cats on Wreath ornament. It features all 3 of my tortie ladies with "We've Got Tortitude" written on the bottom. The ornament and personalization options are endless, and besides pets you can also create ornaments for a multitude of other life events. The ordering process is easy as pie, and amazingly enough, I ordered my ornaments on Tuesday and they arrived on Friday, so you'll have plenty of time to enjoy them on your tree. In addition to making something special for yourself, I can't think of a more meaningful and unique gift idea for anyone you have to shop for. I can guarantee I'll be ordering more ornaments, both for myself and for gifts! Do you have personalized ornaments on your tree? Disclaimer: We received product compensation from Personalized Ornaments for You in exchange for an honest review. All opinions are our own and we never recommend a product we don’t fully believe in. Those ornaments are all lovely. My favourite is Angel Truffles on a cloud. Actually I think I really like them all equally. I love these - they are all adorable! Great ornaments! We DO have some purrsonalized ones! We don't put up a tree, so no ornaments here! But these are very cute, and I'm sure that they sell a ton of them this time of year. 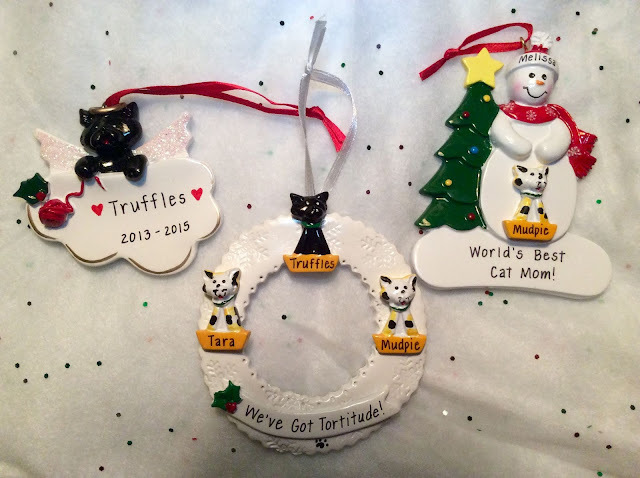 I love the 'We've got Tortitude' wreath, that is precious! We love purrsonalized ornaments, too! We have a few on our tree. We each have several ornaments with our names on them. Oh my goodness, I love these ornaments so much! I have some personalized ornaments on my tree, primarily dedicated to my angel Rosie. I have been meaning to get some for all of my current furbabies, too, so now I'll definitely be looking into these beauties. Thank you for sharing such fun and festive goodies with us!